Team Daugherty is looking for skilled Software Engineers to add to our collaborative and talented team in Minneapolis! No two client projects are the same. With every project comes the unique opportunity to problem solve. All of our consultants are fulltime and support eachother working on teams. Java, C#, Scala, Kotlin, iOS, Android, PHP, Groovy, etc. The recruiting process at Daugherty is different for every candidate. We want you to feel excited to join our team. We want you to be eager to take on a new challenge. We don’t want Daugherty to be just another job, we want Daugherty to be your dream job. Life at Daugherty isn’t like your typical consulting job. Every team member plays an integral role in our company’s success, and we treat you that way, starting with our culture. In our Dev Center, specifically, we like to say that we have the culture of a startup with the security of a 30+ year old company. By that, it's a casual, relaxed agile shop focused on helping you create your best work. (And - A casual dress code is just one part of that success.) The other side... Our consultants work in the cities they live, and you don’t have to worry about your job ending when a contract is up. Our team is helping fortune 500 clients build solutions across a plethora of technologies. It's exciting, takes superior focus, and incredible passion for your work. 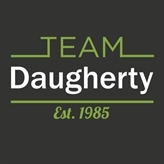 Do you have what it takes to be part of Team Daugherty? Bottom Line—We hire smart people, help them cultivate their talent, and celebrate their successes. This is the best job you’ll ever have, working with some of the most talented people of your career. Want to get notified about new jobs at Daugherty Business Solutions?